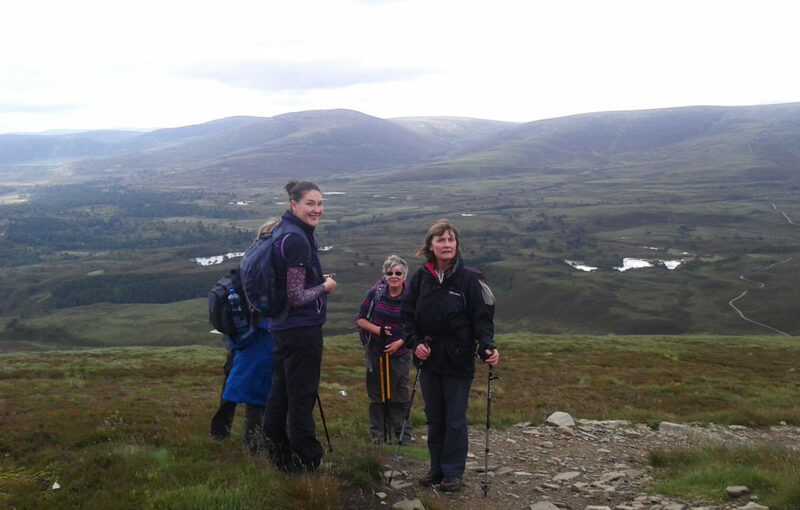 Our Take A Hike gang headed to the Cairngorms for a trek up Meall a’ Bhuachaille. 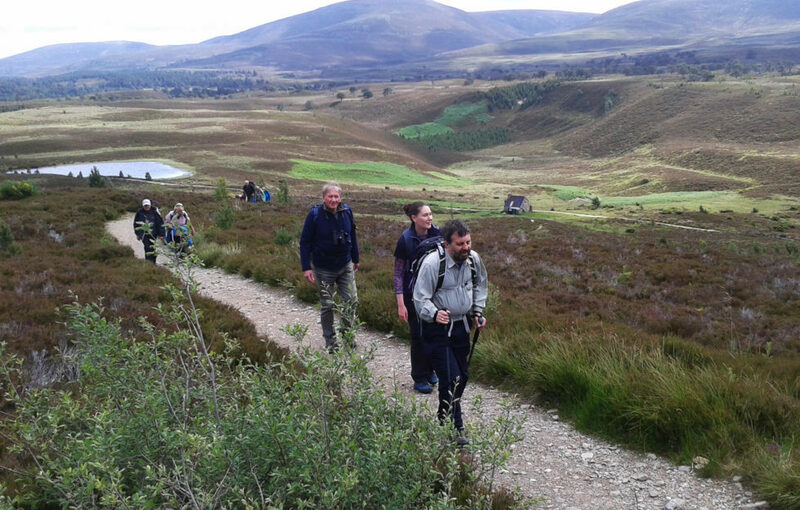 Most of our members are no strangers to these parts, but believe it or not the Take A Hike gang had never hiked in the Cairngorms together before. 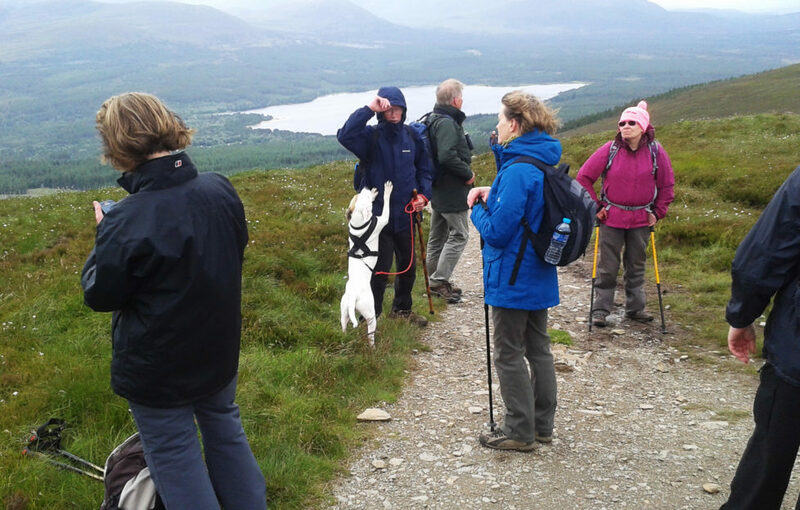 Hike organiser, Garry, felt it was about time we changed that, so July’s hike was set for Meall a’ Bhuachaille, a Corbett north of Loch Morlich by Aviemore. 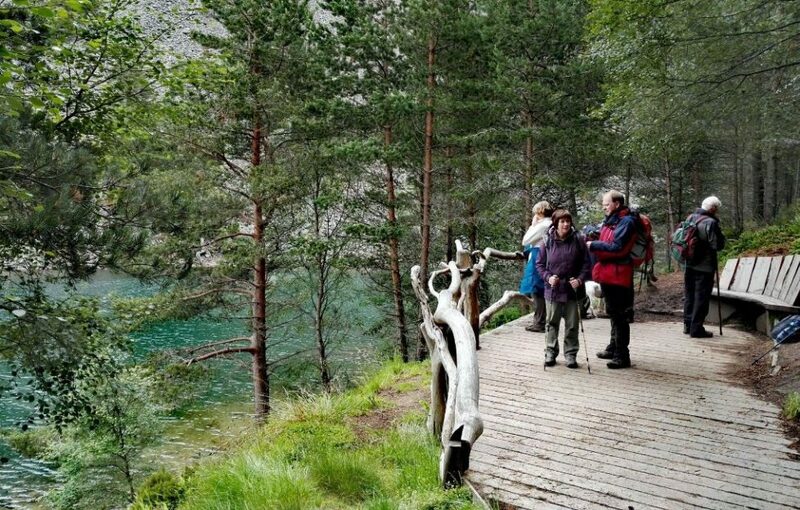 Just under 30 of us met at Scotland’s National Outdoor Training Centre, Glenmore Lodge, and headed up the wide track through Scots Pines. The forecast had deemed waterproofs appropriate, but we were fortunate. 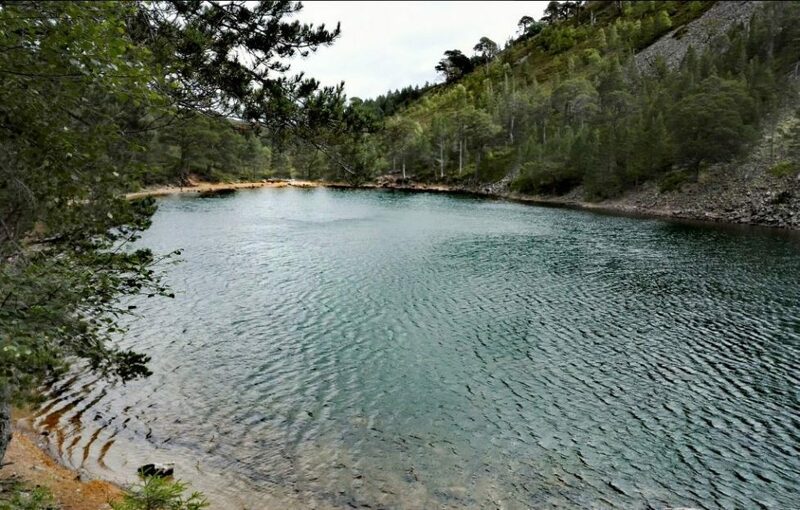 By the time we came upon An Lochan Uaine, the Green Lochan, the sun was shining, making the strange hue of the lochan waters all the more spectacular. 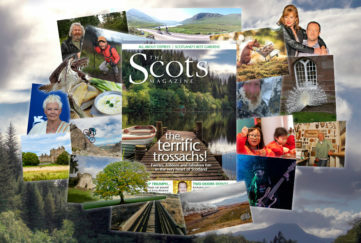 Not far beyond the lochan lay the Ryvoan Bothy. It’s maintained by volunteers from the Mountain Bothy Association, and we found it in good nick, with a copy of the poem Tonight I Leave From Euston by A M Lawrence still on the door, as tradition dictates. The track in to the bothy is a gentle incline, but it was only a warm-up for the main ascent of our journey up Meall a’ Bhuachaille. 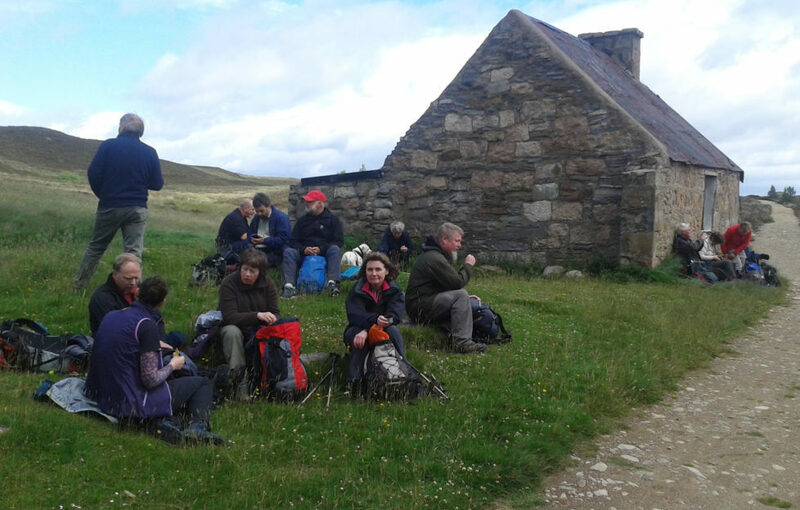 We sat for a cuppie at the bothy to look up at the zig-zag path on the mountain towering above us. Hmmm. I’m not going to lie, it was steep. 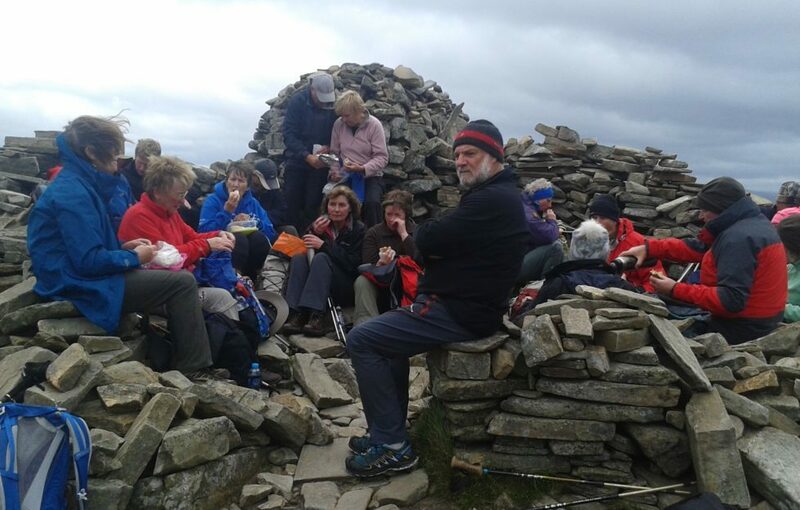 The rough steps cut into the Corbett’s flank were gruelling, but it wasn’t long before we’d reached the half-way point and lunch was definitely in order. 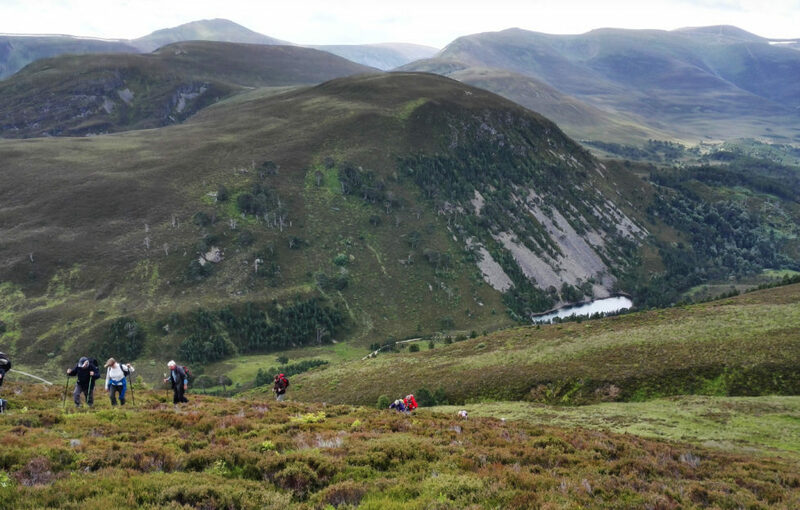 The views, even from here, were fantastic, and it was good to have the “mountain experts” Cameron McNeish and Nick Drainey on-hand to identify the peaks around us – from the gnarled plateau of Ben Avon, right across the Carngorm massive to Braeriach. After we’d eaten our fill of both our pieces and the cloudberries growing through the heather around us, it was time for the last push to the top. The huge wind-shelter cairn on the summit was welcome as by this point the wind had more than picked up. It was really strong on the summit, and we were being buffeted all across the path on our way down. 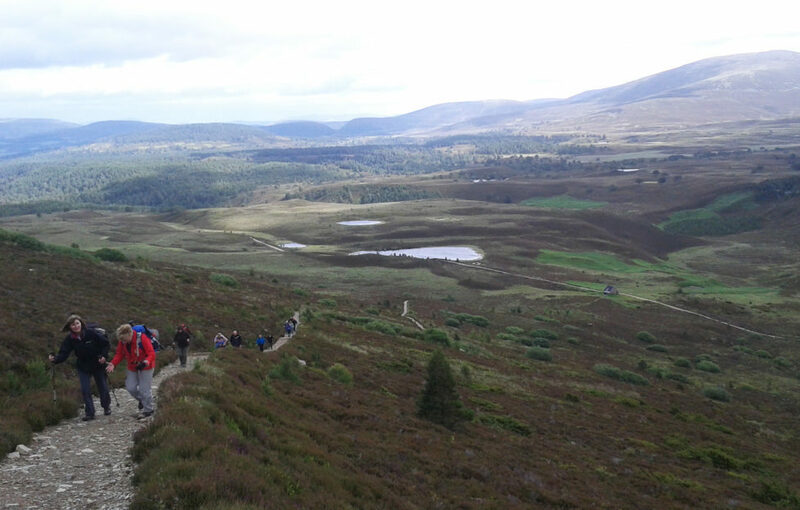 We descended into the sheltered pass between Meall a’Bhuachaille and Creagan Gorm, then turned off the ridge to descend by a forestry commission track back to the Glenmore Visitor Centre on the shores of Morlich. 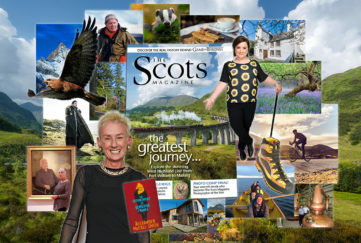 I’m told the ridge makes for a great day’s hike across to Craigowrie – but another day, perhaps, for by now the promise of ale and chocolate cake at the Glenmore Lodge were calling. At each hike we take a collection for charity, and this hike was no exception. 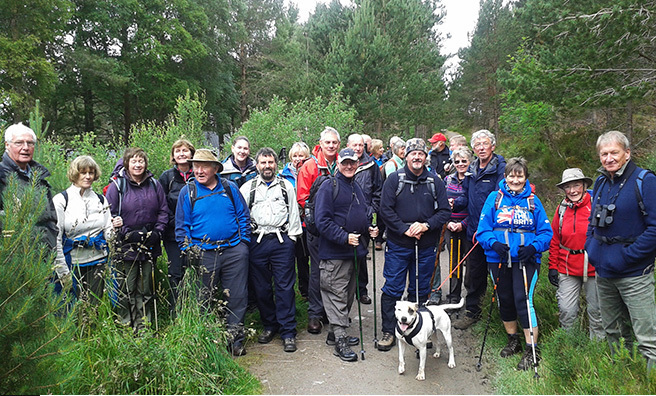 We raised £360 for Cairngorm Mountain Rescue – a fitting charity to fund-raise for on our first Take A Hike venture onto the Cairngorm hills.